Why do smart students fail and how do social systems influence their success? Understanding mentorship and community to create engineers. 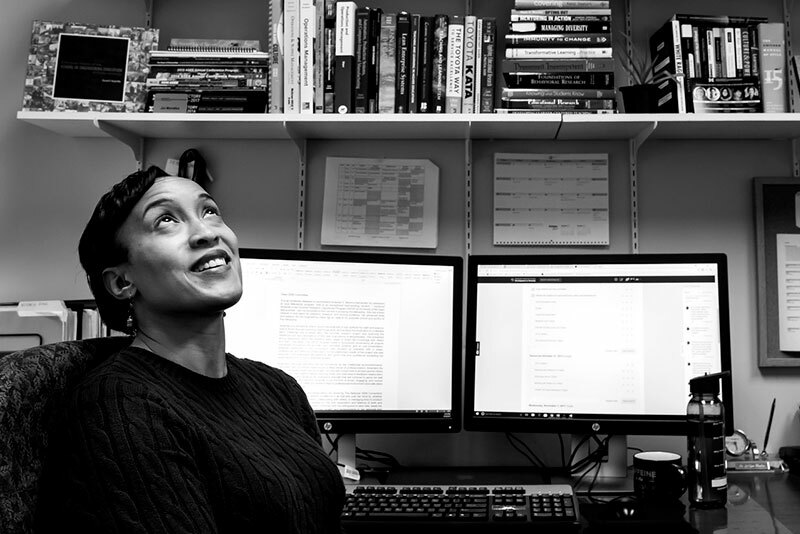 In one of her first engineering classes, Joi Mondisa encountered a problem – one that would lay the foundation for her life’s work as an engineering education researcher. In the late 1990s, she had graduated at the top of her class at a multicultural high school in suburban Chicago. She had always excelled in math and science and worked well with other students. A college major in engineering seemed a perfect fit. But at university, it was different. In one of her very first class discussions, she attempted to contribute to the group discussion. However, her ideas were ignored. Mondisa noticed that some of her classmates chose not to sit next to her. And while classmates would work together on the homework, no one collaborated with her. She grew uneasy. What was she doing wrong? She confided in a trusted faculty member – someone who would become one of her most influential mentors. But he had a hard time understanding Mondisa’s experience. He is a white man. She is an African-American woman. This situation was not unique – not for her, or other underrepresented minority (often referred to as URM) students. A steady stream of studies from the 1990s to today has shown that many African American students experience a “chilly” campus climate at predominantly white institutions. In a challenging major like engineering, this lack of connection provides, at best, little support for the student, and at worst, withdrawal from the field. Scholars say it’s partially to blame for the low numbers of URM students in engineering. Mondisa got through both her undergrad and grad school. In 2014, she attended Michigan Engineering’s NextProf, an annual workshop for women and URM early career scientists and engineers who are contemplating careers in academia. Today, Mondisa is at Michigan Engineering as an assistant professor of Industrial and Operations Engineering (IOE) and an engineering education researcher. From this unique perch, she is analyzing systems within engineering education. She’s taking a quantitative approach to answering one of the most complicated questions in engineering education research: What is the role of social community in the retention of engineering undergrads, especially URMs? Industrial and operations engineers analyze and optimize some of the most complex systems known to humans in areas such as healthcare, ergonomics and disaster planning. 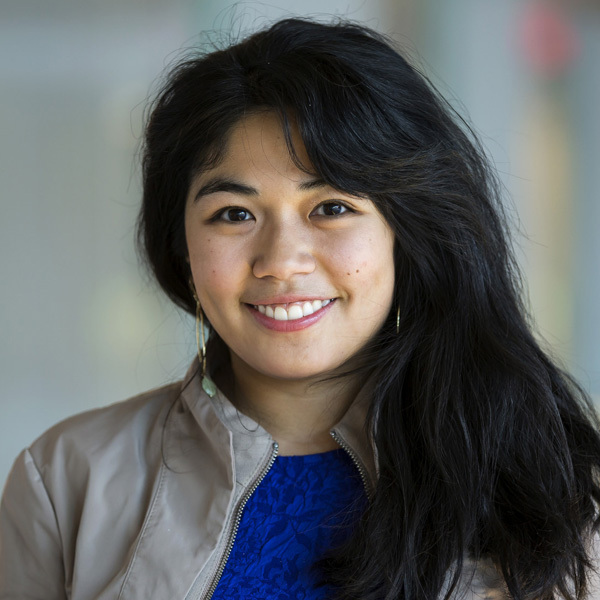 From her uniquely valuable position at the intersection of engineering and engineering education, and informed by her life’s experience, Mondisa aims to illuminate what mentoring methods, approaches and programs actually work – and why. She began by studying the mentors themselves. The work has just begun. 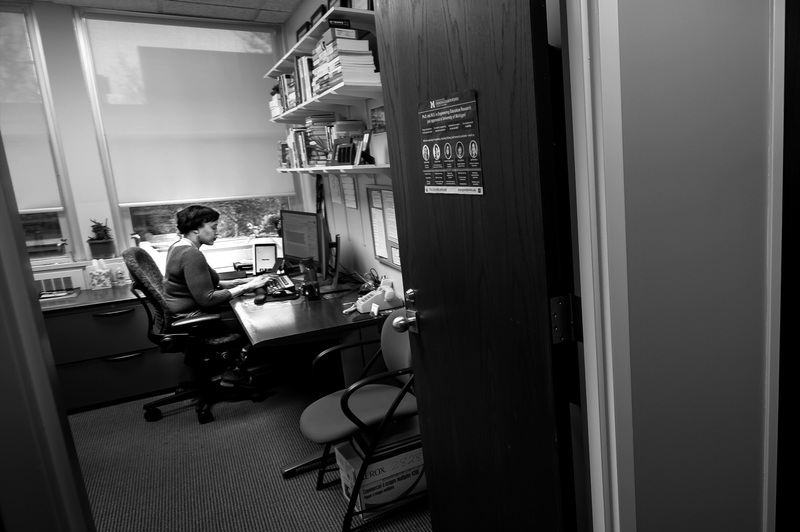 Joi Mondisa, assistant professor of Industrial and Operations Engineering (IOE) and engineering education, in her office on North Campus. 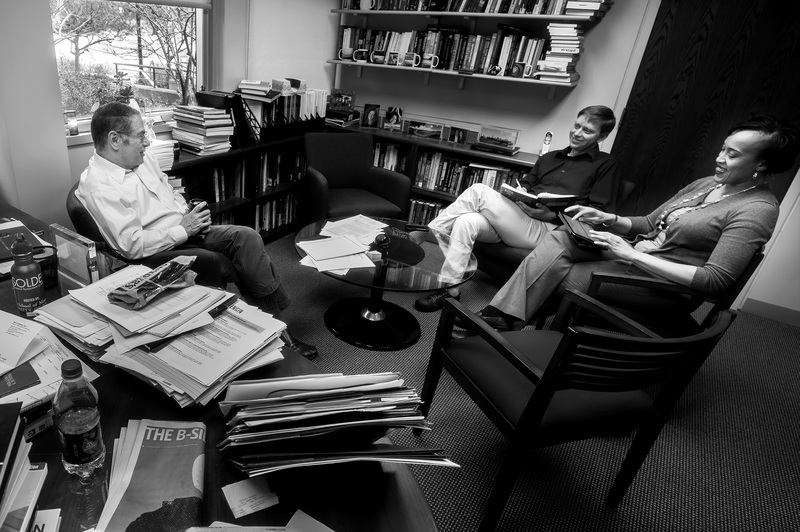 Mondisa (right) discusses research with Seth Guikema (center), associate professor of IOE, and Mark Daskin, IOE chair. Mondisa earned her bachelor’s degree in engineering in 2001 from the University of Illinois at Urbana-Champaign. She worked in industry for 10 years and completed an MBA during this time. Then she returned to school and earned her master’s in industrial engineering and PhD in engineering education. In 2016, she accepted a tenure-track position at U-M.
Then why are success stories like hers still so rare? The engineering workforce is no more diverse now than it was when Napster debuted and Y2K was a looming concern. In 2001, when Mondisa graduated, 1.74 percent of engineering bachelor degrees were awarded to African-American women. In 2015, almost fifteen years later, the number had fallen to below 1 percent. In fact, African-American and Hispanic students are more, not less, underrepresented at top universities than they were 35 years ago. Both academically and professionally, the representation of women and minorities in engineering has either plateaued or started to backslide for the past two decades. In 2014, women accounted for 24 percent of the engineering workforce, down from 25 percent in 2001. And at the same time, African-American and Latino workers represent 29 percent of the general workforce, but just 16 percent in advanced manufacturing, 15 percent in the computing sector and 12 percent of engineers. That’s years of lost potential for diverse engineers. It could also add up to lost revenue for the entire industry. McKinsey researchers in 2015 found that companies in the top quartile for racial and ethnic diversity are 35 percent more likely to have financial returns above their respective national industry median. And companies in the top quartile for gender diversity are 15 percent more likely to have better financial returns. Engineering is a career with high status, big paychecks, and opportunities to contribute to society. It’s an elite program of study that can break cycles of generational poverty. Engineering degrees are prized across cultures. This exceptionalism has created a system of educating engineers that many believe is calibrated to allow only a certain variety of student to survive. It can be cut-throat and competitive. And that might push out students who don’t exactly fit the mold. Not everyone sees that as a problem. In a 2016 nationwide survey of engineers co-sponsored by the Society of Women Engineers, 16.8 percent of male engineers expressed the view that diversity is threatening the quality of the profession and that women now have unfair advantages. Compare that to 3.6 percent of male lawyers in a similar survey. U-M, as well as other engineering education researchers like Mondisa, are working hard to shift this attitude for the sake of the profession, and in support of the common good. Engineering education research is an emerging field, a discipline that came to prominence in the 1990s. Concerns were mounting: the supply of engineers wasn’t adequately meeting the demands of a nation facing increasing global competition and an appetite for technology. In 1995, the National Research Council, part of the U.S. National Academy of Sciences and the U.S. National Academy of Engineering, published “Engineering Education: Designing an Adaptive System,” which outlined the steps to address the “needs and realities” of the United States and the world in the 21st century. The council imagined the world would need a bigger, more diverse pool of engineers to address the global challenges facing humanity. Purdue University, where Mondisa completed graduate studies, established the nation’s first school of engineering education in 2004. Michigan launched its own engineering education program in 2017 and the Engineering Education PhD program launches in fall 2018. Michigan’s program is unique in that it embeds engineering education researchers in traditional engineering departments as a way to bridge the gap between theory and practice. No other large research university takes this approach. “Sitting side by side with our engineering colleagues means we have an immediate way to implement our research findings into practice,” said Cindy Finelli. “We really have an opportunity to improve society by helping develop better engineers,” Finelli said. “We’re applying research methods and practices from education and sociology to study questions in the context of engineering. It spans the entire engineering ecosystem – how can we encourage K-12 students to explore STEM concepts? What can we do as faculty to help support a broader group of undergraduates? What mentoring practices would be the most effective at helping grad students? Or what we can do on a policy-level? Engineering education research departs from the traditional view of engineering: Math and science are driven by right answers, so shouldn’t it be possible to graduate the best engineers simply by fostering competition for the best scores? So what’s needed beyond math and science skills? Engineering education researchers point to three traits previously identified by psychologists: grit, resilience and persistence. Grit is a deep commitment, or an ability to continue even in the face of adversity and inevitable failure. University of Pennsylvania psychology professor Angela Duckworth, who has popularized the concept, found that grit is a better predictor of success than talent. Resilience is the ability to bounce back from failure, like from receiving a bad grade, and persistence is the ability to stay focused, like completing a semester-long project. Mondisa and other engineering education researchers are examining how to help engineering students develop these critical character traits. Students with these traits will be more likely to survive engineering’s rigorous curriculum. Those without them, even top talent from the competitive high schools, are at risk of failing, especially in their first year. One of the keys to this, Mondisa believes, is community. And one of the crucial benefits of community is mentorship – from both peers and faculty members. Mondisa believes that mentorship matters. Research shows that mentoring minority college students makes them twice as likely to stay in school as their non-mentored peers, and to have higher GPAs. When she launched into her engineering education PhD program, Mondisa, like many researchers, was interested in studying protégés. But as she reflected on her own experience, she flipped the model to examine the mentors themselves, why they’re effective, and what mechanisms help students develop the toolkit they need. 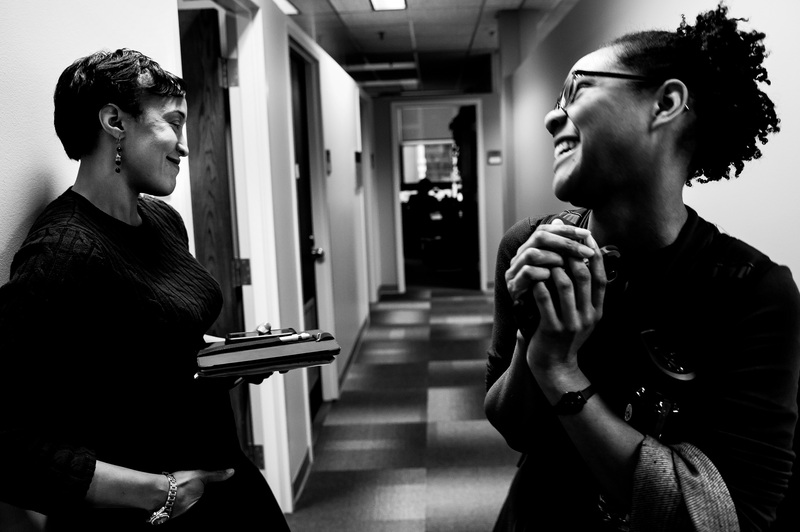 IMAGE: Valerie Washington, an IOE PhD student, and Mondisa discuss a potential project in Mondisa’s office. Mondisa smiles when she remembers that first college mentor. “He really is a great mentor,” she said. Throughout the rest of her undergraduate career, he shared with her what she describes as “social capital.” He illuminated the internal structure of higher education and how the world of research worked, unlocking key pieces of information that she needed to keep reaching for the next step. In her research, she is examining how and why mentoring works – in the context of engineering. In her current research, she uses mixed methods – both qualitative and quantitative approaches. In a qualitative study, Mondisa interviewed underrepresented minority STEM mentors. Results from this study indicated that mentors share coping strategies and knowledge about their experiences with their protégés. Mentors also use cultural and social capital to motivate and connect. In addition, she found that some mentors take a holistic approach to mentoring their protégés and they encourage them to advocate for themselves. Mondisa knows firsthand how social factors can loom over an undergraduate experience. During her undergraduate career, some people went out of their way to let her know they didn’t think she belonged. For example, they asked her if she was admitted into the program under the university’s affirmative action plan. These social roadblocks began to stall her upward trajectory. Mondisa found what she called “her saving grace” in a group of students who were experiencing similar phenomena in their classes. They were her fellow Merit Scholars at the University of Illinois at Urbana-Champaign. The program provided a social community for Mondisa, where she could find the support she needed to get through. “We’d say, ‘We all got into this program. We’re all graduating,’” says Mondisa. They became a tribe who helped each other survive. They met for study groups, exam prep and an occasional movie. “That community was critical for my survival. We were all from different backgrounds – black, white, city and suburban kids, as well as kids from farms and rural areas. What was also important is that we were not remedial students,” Mondisa said. “We were the high-achieving, ‘cream of the crop’ students from our high schools, but we were at risk of not graduating from university because of environmental factors.” Mondisa knew from her experience that the social community played a big role in completing her engineering degree. She held onto the idea that this saving grace could be studied and replicated. “I’m an industrial engineer. I want to understand systems,” she explains. There is a system at work, and it can be empirically studied, she reasoned. Mondisa teases Washington about her long list of ideas on where to focus her graduate studies. As Washington’s co-advisor, she understands the need to help Washington direct her passions. 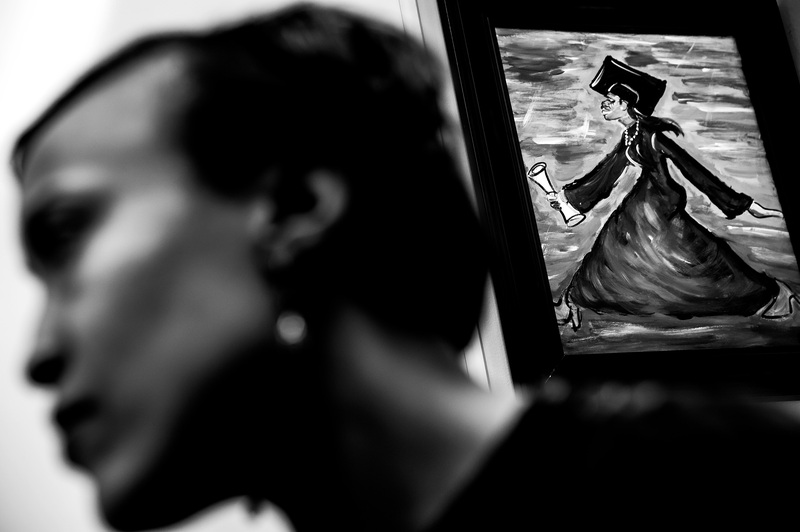 A portrait of a black female donned in a graduation gown hangs in Mondisa’s of ce. It comes from a community workshop that she and her engineering education cohort attended while at a conference, and serves as a reminder of the role her own community has played in her life. Now this work has begun in earnest, even if it is in the early stages. She is a new U-M professor in a young field. Her research contributions include a “social community scale” and a “social community model” to begin empirically assessing social communities, environments where like-minded individuals engage in dynamic, multidirectional interactions that facilitate social support. The scale makes the connectedness of a community measurable. Mondisa and Sara A. McComb from Purdue University used it in a study published in March about the role of social community in minority mentoring programs. The study surveyed 179 current and past members of the Merit Program for Emerging Scholars at the University of Illinois at Urbana-Champaign. Participants were asked to answer a series of questions about how connected they feel to others on campus and how satisfied they are, in general, about their school. The study analyzed how people experience social community differently based on demographic factors such as being male or female, undergraduate or graduate, and white or non-white. One of the findings of the study was a significant relationship between connectedness and race: The connectedness mean for whites was 3.75 out of 5 and 3.47 out of 5 for non-whites. Based on the findings, the study called for more research about why non-whites feel less connected, in order for universities to improve the effectiveness of mentorship programs for these populations. Overall, the research reveals the underpinnings of social community. The more we understand it, the better we will be at fostering it. This research can help colleges identify sources of a lack of social community, as well. The Social Community Model was used in this research. 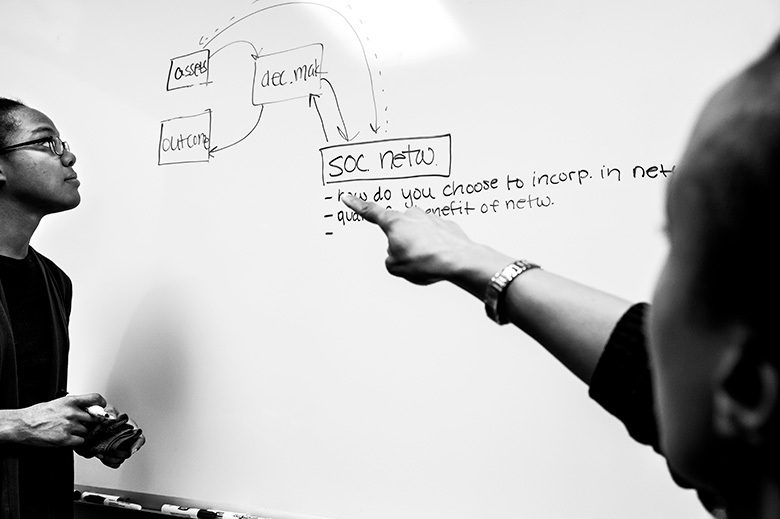 The Social Community Model is a framework that can be used to examine participants’ program experiences and outcomes and empirically assess engineering mentoring programs like the Merit Scholars Program. Such programs have been successful in promoting student retention and many engineering schools have similar programs, including the University of Michigan’s M-STEM program. Mondisa studies the social mechanisms within these programs. She pays close attention to the participants’ outcomes, such as their ability to be resilient, engage in communities of practice and build social capital. In a social community, group members need to share a similar mindset. They don’t necessarily have the same ethnicity, socio-economic status or other demographics. But they are a part of a community because they share values and goals like becoming an engineer or passing a class. Mondisa noted that people in such a community tend to experience a reduction in friction and an increase in cooperation. They work toward similar ends and share that knowledge with everyone in the community – no matter their demographic differences. The model offers a way of understanding the costs and rewards for all members who create social support through the back-and-forth of their interactions. It can be as simple as spending time solving problems they understand and receiving help from other individuals about problems they cannot solve. But they also gain social capital, which they can “spend” in their community – for example, trading chemistry notes for a bit of tutoring on last night’s calculus homework. Mondisa points to a painting that hangs in her office. On a background of deep red – her favorite color – stands a black woman holding her diploma proudly. It’s a reminder of the importance of her own communities. Several women of color in her PhD program helped form Mondisa’s social community. In reflecting on her experiences as part of this community, Mondisa says she received the support she needed. “We’re all in this together. Knowing you’re not in a situation alone helps you to continue.” Mondisa continues to contribute to and access her support resources. Perhaps one of the most important intangible assets that students receive from their social communities is how to value and work in what is called “communities of practice.” She’s found that the communities don’t end when the mentoring program does. Participants can seek out new communities of practice or even create them. It’s happening around her at U-M, as she holds up a mirror to an institution charged with building the next generation of engineers. Using data, she’s showing what’s required to achieve the vision of a global, diverse and collaborative workforce of the future. It’s not enough for engineers to build mentoring programs and methods based on what’s going on in social and behavioral sciences – they want the schematics, they want to build it, test it, and they want to make it better. Mondisa put her hand on her heart. She was relieved and elated to hear that comment. What is engineering education research? Michigan is 2nd in the nation for female tenure and tenure-track faculty. Join their ranks at NextProf.